Here's the thing with white houses: they are usually snooze-fests. It's where creativity goes to die, and all that jazz. Probably because it's a 'safe' colour. Which is a shame really, considering the colour is essentially providing you a blank space to splash your magic on. 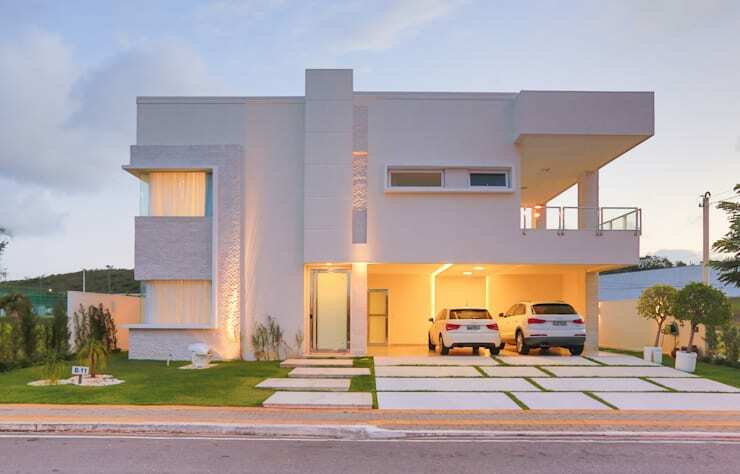 That's why we love today's home, designed by Brazilian firm Rita Albuquerque; sticking to white and other pastel shades, they have designed a house that is by no means a creative phenomenon, but an example of how even small creative tweaks can almost entirely impact the final outcome. The elegant family house largely keeps it modern but allows a bit of old-world charm here and there, which ultimately softens the overall effect. The space has two levels, the top one housing a bedroom and a generously-sized balcony that affords a good view, thanks to a lack of high-rise buildings in the immediate vicinity. Here's your virtual tour of the place! Combining textures, patterns and shapes right on the facade is an admittedly risky project, one that can look great on paper but like a hot mess when it's actually executed. Thankfully for the owners of this house, the architects' risk paid off. Playing with different elements actually makes for an interesting yet cohesive appearance. The lighting (and the shadows it creates!) and the partly-tiled lawn almost gives the place a look of a spa or a high-end wellness retreat. And that just means your house looks like a super stress-free zone. How does a room that has cream ceilings and walls, cream floors, cream furniture and even cream curtains not look like a complete wash-out? 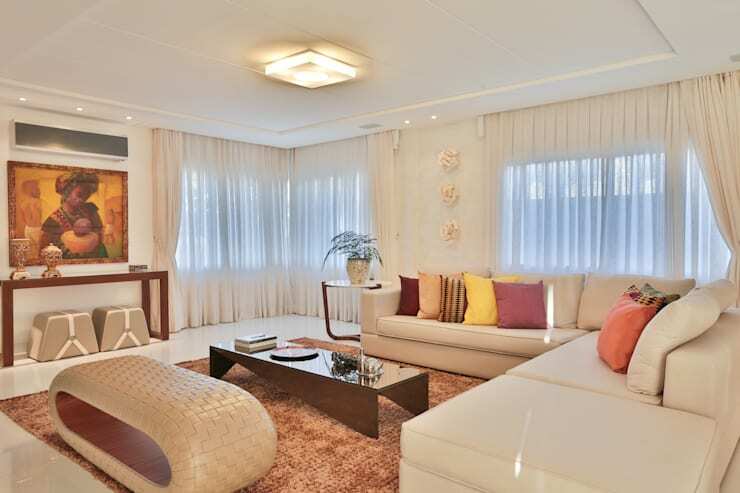 The answer is simply that you break up the mono colour scheme by adding accent pieces whether it be colourful throw pillows and curtains or unusually-shaped furniture accessories. The end result is that it actually feels calming. By keeping the light low-level (there's enough natural light coming in through the room), the living space feels even more inviting. Considering that, on an average, we actually spend 1.5 years of our total lives in the bathroom you can bet your sweet acorns that it is one of the most vital areas of a home. So how do you make the most of out of the space you have? Make like the architects here, and kick off things by making the space look larger than it actually is. They manage to do that by here by keeping nearly everything white and by adding large glass mirrors and glass shower doors. 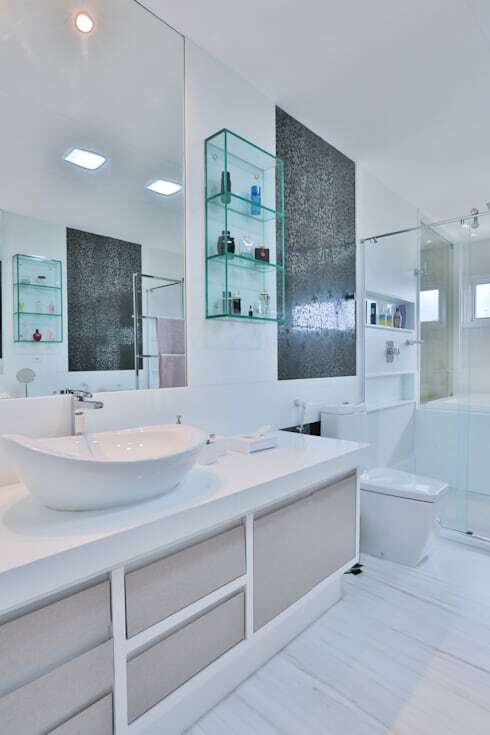 The granite rectangular tiles above the toilet acts like a mirror image of the mirror and brings in an interesting visual element. The shower door cordons off the bathtub and the shower space giving the impression of the two being two separate areas. The kitchen favours and adopts a more modern industrial approach instead of the softer palette of earlier. 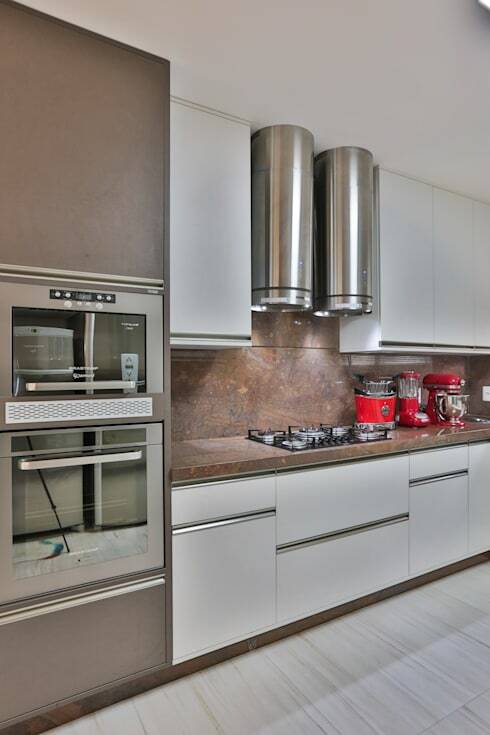 And so you have the stainless steel exhaust hoods, white streamlined kitchen cabinets and a rather heavy-duty-looking in-built oven and microwave. The patterned marble kitchen top lends an air of classiness to the otherwise stark decor in the kitchen. The dining area of this house is where the old and new very subtly meet. You get the feeling that Marie Antoinette would have been fairly happy here with her towering cupcakes and kitty parties. Done up almost entirely in cream again, to maintain consistency with the living room, it is the old-world and charming teardrop chandeliers that shed a light rose hue across the space making dining here a wonderfully pleasing experience. 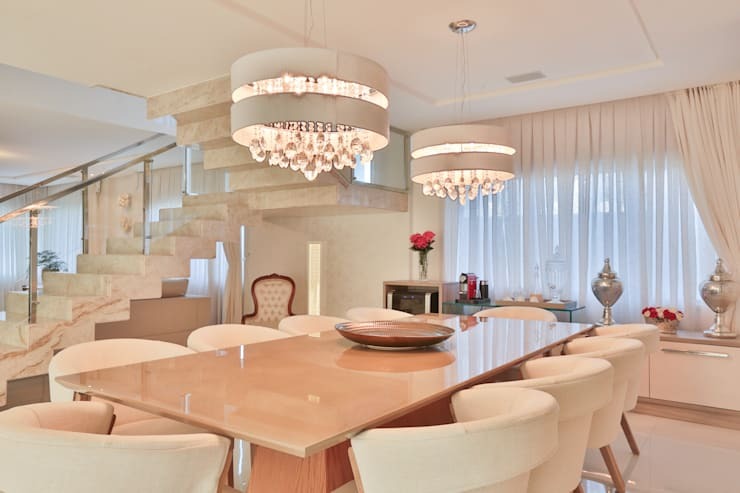 Finding the perfect lighting for your dining room is essential, so if you're looking for tips and tricks, we suggest you head here. This is also where the ground floor connects to the second via an elegant flight of marble stairs. If you are looking to be inspired further by neutral and pastel palettes, check out 12 subtle ways to add pastel colours to your home. Do you think the palette of neutrals works here? Let us know in the comments below!